BlackBerry Ltd.'s fast-growing automotive division help the Canadian tech company double its second-quarter earnings when compared with the same quarter a year ago. 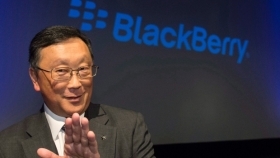 The company beat expectations through growth in its enterprise software and services business, as well as in its automotive division, John Chen, BlackBerry's executive chairman and chief executive, said in an interview. As a result, shares soared Friday after its latest financial results topped expectations and BlackBerry outlined plans for growth in autonomous driving, a push into health care and intentions to add significant engineering talent. "Transportation, especially when it comes to autonomous driven vehicles and connected car, that unit had done the best in the last quarter," he said. The company, which keeps its books in U.S. dollars, said it earned US$43 million or eight cents per basic share in its latest quarter, more than double earnings of $19 million or four cents per basic share a year ago. On an adjusted basis, BlackBerry said it earned four cents per share for the quarter, beating the penny per share profits analysts on average had expected according to Thomson Reuters Eikon. While overall revenue dropped to $210 million from $238 million last year, the automotive division saw 29 per cent revenue growth with more to come, said Chen. "It will continue to grow double-digit for the next couple quarters, so we think that is a big growth opportunity for BlackBerry." The company recently announced a partnership with Ottawa-based technology accelerator L-SPARK to help small- and medium-sized businesses bring new products to market using its BlackBerry QNX automotive software. Chen said the company also plans to ramp up efforts in autonomous driving and other divisions. "You ask our own people, who are much more bullish than I am, they're talking about adding a thousand engineers," he said. "It's going to be multi-years, I mean you can't find a thousand engineers because there's such high demand and short supply. But we do have the advantage that a lot of our development organization is in Canada, so we're very closely tied to the university programs. So we're going to hire a lot of engineers I'm sure." But while technology development is ramping up on the automotive side, Chen said he's more cautious than his colleagues as to when we'll see fully autonomous vehicles take hold. He said the technology should be available and affordable in the next few years, but thinks infrastructure and policies on safety and other issues will push back a widespread rollout. "I'm encouraged for the future, I just think that most people think it's going to happen faster than I think it will."